This drill is primarily for defensive players. The player is always facing forward and is to keep their feet moving as much as possible. The player begins without the puck and quickly receives a pass from the next player in line. 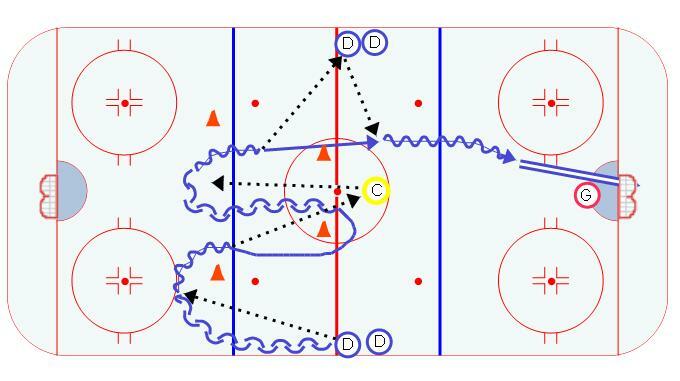 After receiving the pass, they pivot around the cone and give the coach at center ice a pass. They then skate forward to the red line and pivot to a backwards skate and gets in good position to receive a pass back from the coach. Once they receive the second pass they pivot to a forward skate and perform a give and go with the next player in the other line. The player continues into the offensive zone and shoots.